Once a region understands the range of air quality problems that exist, establishes air quality goals along with timelines to meet those goals, is aware of consequences of the failure to attain these goals, and has identified and begun the process of developing an inventory of the sources of its problems, and understands the future direction and growth of a region, it is possible to begin the development of an air quality management plan. An air quality management plan simply describes the air pollution problem and lays out a path to its solution. 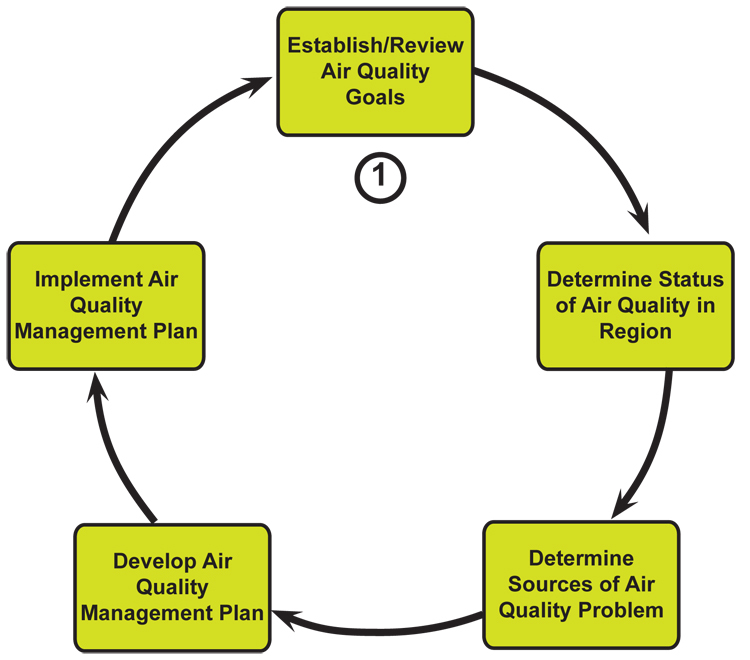 An air quality management plan typically mirrors the process described in figure 3.6.1-1. 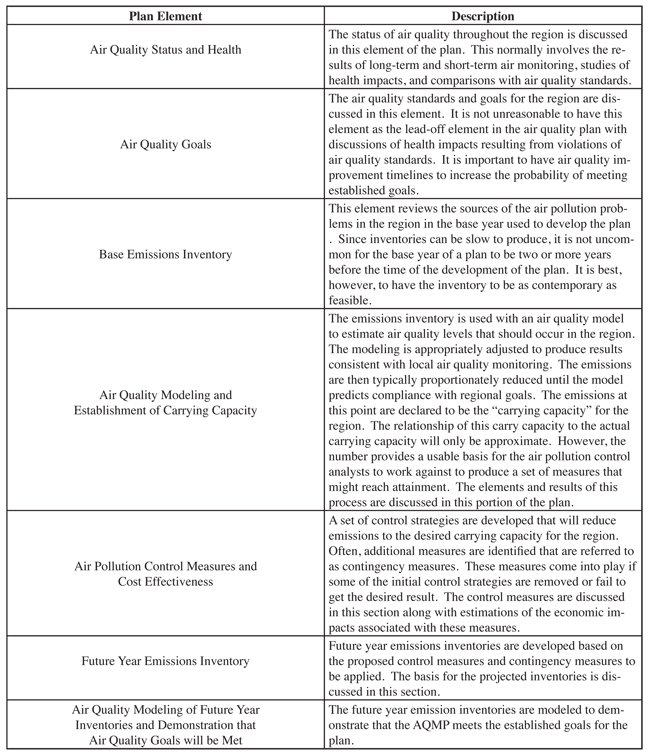 The key elements of most air quality management plans are outlined in table 3.6.1-2. It is tempting to envision the development of a different air quality management plan for each pollutant of concern. This approach can lead to some bad policy choices. The sources of pollution that contribute to the various air pollution problems are generally the same. The sources of particulate matter problems, the sources of ozone problems, and the sources of climate change problems tend to be the same sources. On top of this, solutions that reduce one problem can increase the other air pollution problem or at least mitigate some of the solutions. Thus, it is valuable if not imperative that all air pollution problems are addressed simultaneously to the extent that it is feasible. While this increases the work during the development of an air quality management plan, it can lead to much better policy choices in the long term. Unfortunately, an air quality management plan can be very complex and impinges upon every aspect of urban life. Thus, the actual air quality management plan when completed can extend to hundreds or thousands of pages of analysis and discussion of the issues that relate to the regions air quality problems. The air quality modeling activity of the AQMP process can be one of the more contentious aspects of the process. Air quality modeling is at this time approximate even in cases where very sophisticated models are used. Modeling depends upon both the accuracy of the emissions inventory that is used with the model (spatial and temporal distribution), along with an understanding of the meteorology of the region (spatial and temporal), along with the ability of the model to accurately combine emissions and meteorology to predict the resulting air pollutant concentrations. There is considerable uncertainty in all of these modeling elements. Air quality modeling can vary from simple linear emission roll-back techniques to box models to complex reactive modeling of the atmosphere. The results will often agree only moderately with actual air quality measurements. This observed error can be used by opponents to air pollution production as a rational for not moving ahead. It is thus imperative that the best feasible modeling be used and that the policy makers understand the deficiencies of air quality modeling at its present stage of development. 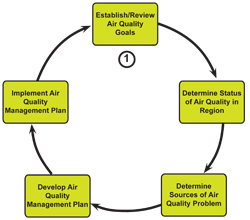 Air quality modeling provides the only approach to estimate the impacts of control measures. One of the reasons for repeating the air quality management process at three to five year intervals is the need to upgrade modeling and to adjust modeling to fit what is actually observed in the regions air quality monitoring network. Air quality modeling typically produces results that are hard to understand by non-technical persons. This leads to the establishment of emission numbers based on the modeling that is referred to as “Carrying Capacity.” Once the air quality management plan is in review by policy makers, this Carrying Capacity is used as the standard to identify the needed emission reductions to reach the air quality standard. While this approach can incur errors, if based upon good air quality modeling, it can lead to reasonable policy decisions and is done in most developed countries. 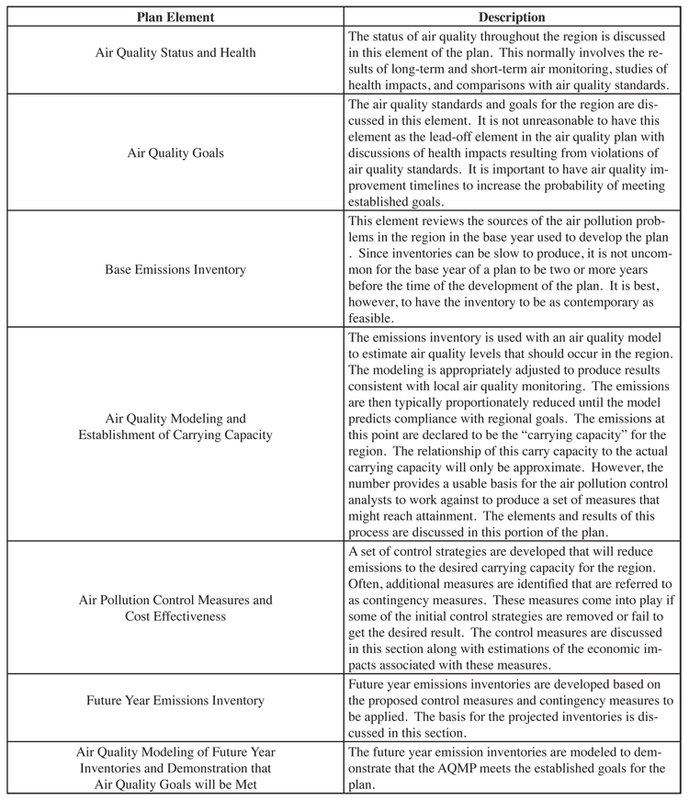 The selection of control measures to be proposed in the air quality management plan is the major debate in most air quality management efforts. Some form of economic analysis is required for many air quality management processes to estimate the amount of emissions reduced or associated air quality improvement compared to the cost to achieve those reductions. In most cases, this can be as simple as estimating the cost of the required emissions reduction and dividing this by the total tons reduced. This calculation produces a cost per ton control analysis, which can be used to select the more cost effective air pollution control measures. More sophisticated economic models exist that are designed to estimate job loss and other economic dislocations associated with proposed control measures. These models have a wide error band associated with them, but can be useful. The difficulty with most of the control measure analysis is that the proponents and opponents of a control measure can carry out analyses that result in significantly different emission reductions and different costs. The differences in the analyses usually result from the fact that the opponents to control measures tend to take a more pessimistic view of the cost and emissions reduction associated with the control measure while the proponents take a more optimistic (and sometimes simplistic) view. The social cost of air pollution and thus the savings to society in lives or reduced medical cost is also a controversial part of most such analyses for an air quality management plan. Debates occur with respect to the value of a human life and the value of improved health. Experience to date indicates that over time the cost of control is reduced over time, due to increases in scale and innovative methods developed by industry, which further complicates the cost analysis. The bottom line as is that air pollution is improved only when emissions into the atmosphere are decreased and care must be taken to select the most cost effective ways to reduce those emissions. Many AQMPs include technology-forcing measures. These are measures that involve technology that is in development but has not actually been applied at the point in time of the development of the AQMP. Since the AQMP is normally designed to take five to ten or more years to be fully implemented, it is not unreasonable to expect that technologies will develop over time if there is a need for those technologies. The AQMP can actually serve as a forcing mechanism to help inspire these new control technologies. Probably the most notable technology forcing requirement can be found in the United States 1970 Clean Air Act. This Act required that on-road gasoline vehicles reduced emissions by 90%. At the time, all manufacturers declared that this was an impossible dream. However, much of the requirement was met by 1978 and all of the requirement was met in the early 1980s. The South Coast Air Quality Management District, which is designated to meet air quality standards in and around Los Angeles, also adopted a number of technology forcing rules over the past two decades. One example is the requirement for architectural and furniture surface coatings that have little or not volatile organic matter in them. At the time of adoption of these rules, the coatings industry declared this impossible. But now, all coatings in use in the Los Angeles metropolitan area have little or no VOCs. There can also be times when technology-forcing rules do not produce the desired results. An example of this is the requirement by the California Air Resources Board (CARB) that 10% of all vehicles sold in California by 2000 be electric. This did not happen and CARB had to modify the rule. Many critics called this technology-forcing rule a failure. However, there were enough positive outcomes to this requirement that it can hardly be declared as a failure. In the process of researching technology to produce electric vehicles, the concept of the hybrid vehicle was born leading to the rapid infusion today of hybrid vehicles into the fleet. Also, as recent oil prices have climbed many manufacturers are building onto the research on electric vehicles due to the CARB rule. Thus, even when technology-forcing rules do not achieve their original goals, they can provide support for meeting clean air standards.